We will describe here a visual representation for paths in information networks, which we demonstrate at first with a 3-dimensional cube. which we can also use for cubes of any dimension and for any kind of information network. But we use at first only a 3 – dimensional cube, to demonstrate it. 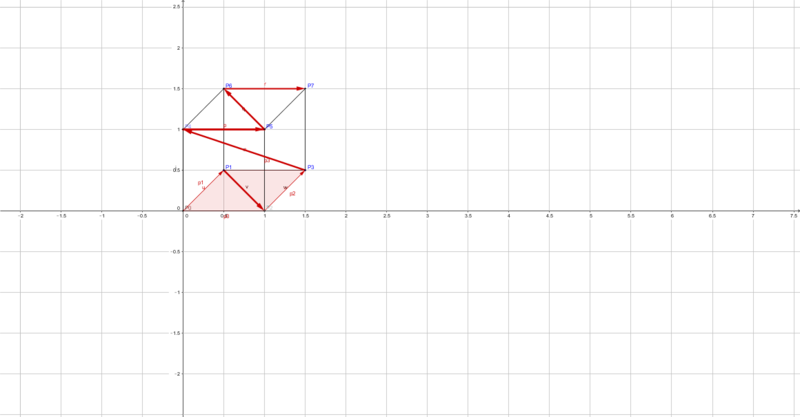 at first we construct a regular polygon with 8 corners. The corner points on it represent the 8 corners of the cube. But the distance between 2 neighbour points on the polygon is not always the same. On the polygon and on both circles we arrange the 8 points in the same order. 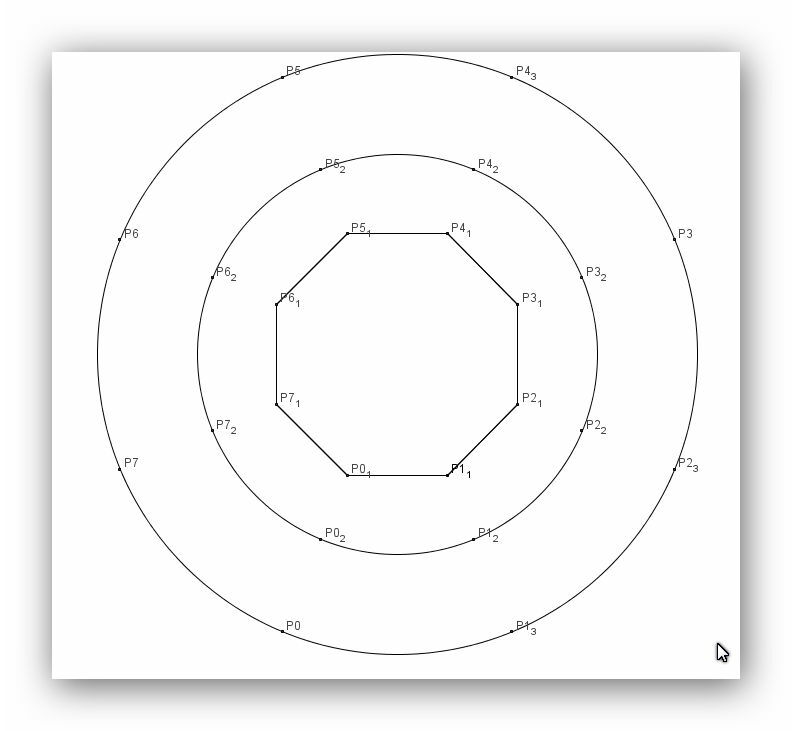 Same points are on the same radius from the midpoint to the outer circle. We start with point P0, which is on the regular polygon. To go from P1 to P2, we have to use a diagonal in a square ( length 1.414) and therefore we go to P2 on the first circle. As usual, one has to use this kind of representation several times, to get familiar with it. With this representation we get a good overview of the structure of the paths in a cube of any dimension. for a cube of dimension n we have a polygon with n corner points and n-1 circles of increasing radii around it. On each circle the n corner points are arranged in the same order as on the polygon; all corner points with the same number are on the same radial ray. points, beween which there are 2 points, are on the second circle. For the radii of the circles we use suitable lengths, so that we get a nice representation. The example with the cubes helped us, to find a good visual representation for paths in abstract information networks. Of course, if there are many points in a network, then we can do all the work only with the help of computer programs. But now we know, what we have to program and we have examples, with which we can test the programs. I prepared the drawings with GeoGebra, which is very good for it. One cannot create top quality pictures with it, which one could use for publications, but it is an excellent tool, to investigate geometrical problems. 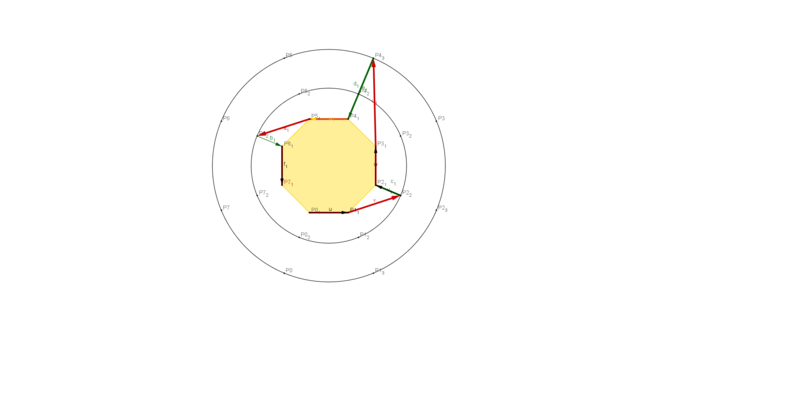 And here is finally the 3 dimensional cube with the path. I think, that even with a 3 dimensional cube, the abstract representation is better, because one sees directly all characteristics of a path. Dieser Beitrag wurde unter information networks abgelegt und mit visualization of paths verschlagwortet. Setze ein Lesezeichen auf den Permalink.